Umbriel is the darkest (and third largest) of the five spherical moons of Uranus and one of the 19 spherical moons in the solar system. Like other moons of Uranus, Umbriel was also named after a character from Alexander Pope’s work. 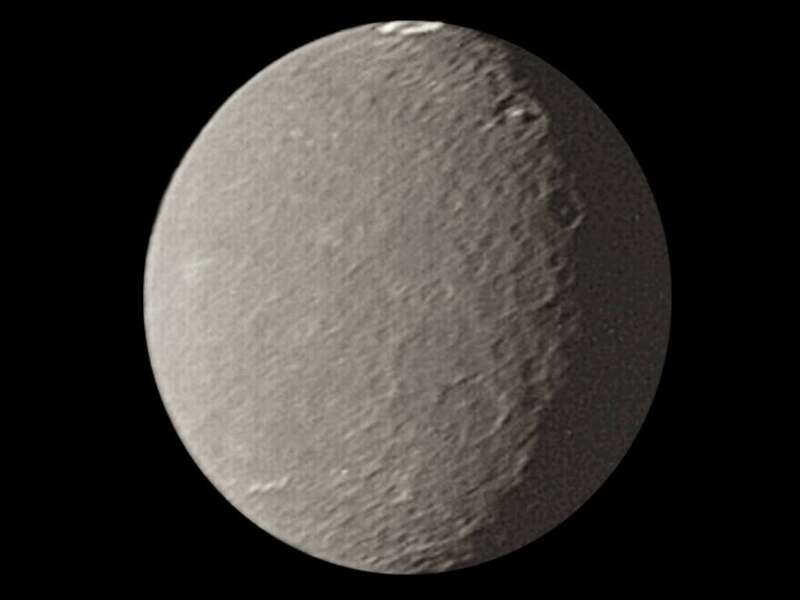 Similar in appearance to several of Uranus’ other spherical moons Umbriel is heavily cratered with few other notable surface features. Fast Summary Facts About The Moon Umbriel! Scientists believe that Umbriel, like all of Uranus’ large moons, is likely composed of an icy mantle with a rocky differentiated core. It is possible that a thin liquid ocean may exist between the mantle and core if sufficient ammonia (or similar antifreeze compounds) and core heat exists. Craters dominate the surface of Umbriel (only the moon Oberon has more) ranging from a few kilometres to over 210 km in diameter! The only other feature identified on Umbriel’s surface is a network of canyons and dark polygons which may have been formed during an early period of tectonic activity shortly after the moon formed. Currently, it is not known why Umbriel is significantly darker than the major moons of Uranus (Umbriel reflects less than half the light that its comparable neighbour Ariel does). The surface has a slight blue colour to it, while the recent impacts with the brighter material (such as the bright Wunda Crater) are even bluer in colour. Carbon Dioxide has been detected on the shaded or colder surfaces of Umbriel, meaning the moon may experience an extremely thin, seasonal atmosphere of CO2. 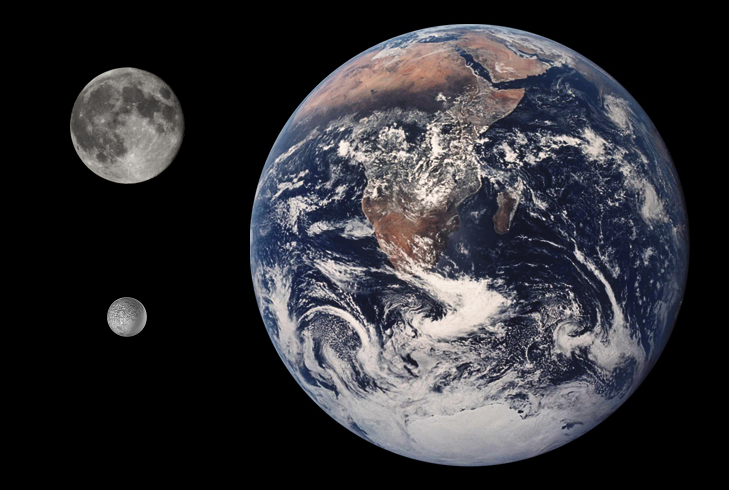 It is believed that early in Umbriel’s history the moon was in orbital resonance with Miranda, driving the little moons internal heating (and geological activity) and disturbing its orbit. The orbit of Umbriel is entirely within Uranus’ magnetosphere resulting in its surface being protected from the solar winds, but also being exposed to Uranus’ magnetic plasma believed to lead to a darkening of its trailing hemisphere. 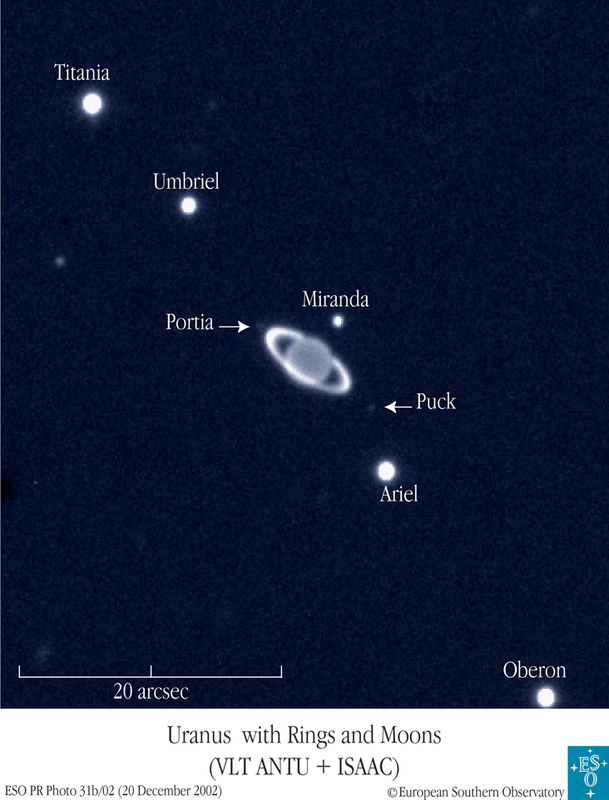 As with the rings and the other large moons of Uranus, Umbriel orbits close to its planet's equatorial plane. 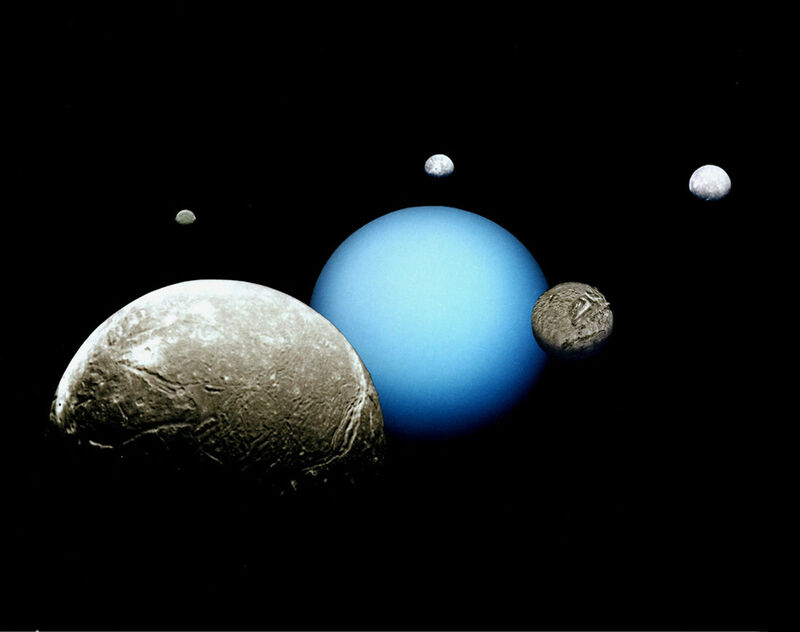 This means the moons share Uranus' extreme seasonal cycle on account of each pole experiencing permanent night (or day) for half a Uranian year – which is 42 Earth years! Every 42 years, around the equinoxes, it’s possible to capture a rare transit of Umbriel as the moon passes in front of Uranus, it can even occult one of the other major moons during this period. It is believed that Umbriel formed billions of years ago, from the accretion disc that surrounded the newly formed Uranus; perhaps even from debris from the colossal impact that pushed Uranus onto its side! The cooling of the surface and expansion of the interior caused strong extensional stresses in the crust which likely lead to canyon formation. The only probe to have visited the Uranus system (and its moons) was the Voyager 2 spacecraft in 1986, where it managed to photograph 40% of Umbriel’s surface during Voyagers brief flyby. Unfortunately, there are no plans for any future probes to visit Uranus (and its moons), but one day it’s hoped that a Uranus orbiter reaches this distant outpost!